At a time when the state of Gujarat leads the pack on economic, political and social front, entertainment is not far behind. Understanding this, ETV Gujarati is heading to a revamp with a renewed programming line-up and look and feel. 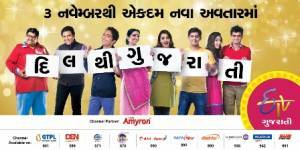 Aiming to cater to the ‘DilThi Gujarati’ (‘Gujarati from the heart’) viewer, ETV Gujarati repositions itself from a hybrid channel to a dedicated Gujarati entertainment channel operational in the state, thus offering a wholesome experience to the viewers. This is the result of availability of more programming space after a separate ETV Gujarati News channel was created in June this year. Adgully caught up with Anuj Poddar, EVP - Viacom18 & Business Head - ETV Gujarati to know more about the revamp. The channel custodians assure that the new shows will mirror the effervescent and fun – loving Gujarati community with shows in the genre of comedy, satire, light-hearted drama, stand-up comedy and unique reality gaming. “Starting 3rd November 2014 between 7.00 pm to 10.00 pm, the revamp is not just a revamp, it is in many ways, setting up a new channel altogether. It is a channel for the Gujaratis, by the Gujaratis and totally in Gujarati. He went on to say that that while earlier the channel offered a combination of news and entertainment, just like other channels in the region, the unavailability of a pure entertainment-focus channel was the market they wished to tap into. “We felt that while a large section of audience in this region fed on Hindi GEC content, offering them something in their language and of their taste will be interesting. Also, not all Hindi content can satisfy a Gujarati viewer’s demands. However, the new content is contemporary understanding the shine of Hindi GEC’s and customise as well, so as to gain in brownie points of being the first ones to offer it!”, he added. However, it is not an easy task confesses Poddar as he beehives that content from the Hindi GEC space continue. “Gauging talent and content to be aired to presenting to it an audience that is not use to such content, it is a little challenging as it is clean slate with no existing prototype to follow”, he said. Poddar is confident that as the channel enjoys a decent viewer-base not only in the state but across the country and countries like USA and UK, the viewer-base will widen after this move. He mentions that though the investments may be high as compared to the current industry standards, it is still lower than those possibly made for ETV Marathi. Speaking on the advertiser and ad-rates front, an optimistic Poddar said, “The state is the strongest performer on the economic charts of the country and offering them an opportunity like this will work for both the advertiser and the broadcaster”. We learn that the first response from the marketers have been positive, following which the channel has taken the leap to hike the ad-rate almost 100%. Sources inform that the channel looks at selling primetime slot at Rs 3000 - 3500. While industry observers maintain that Hindi channels will be priority for marketer, regional channels like these will gain momentum in the coming months. With regards to the marketing plans for the revamp, Poddar said, “We began the promotion from Navratri where we launched the channel anthem, by getting the stars at various on ground events in Rajkot, Surat and Baroda. Heavy duty OOH campaign across hoarding, auto-rickshaws, branding across street-side food stall; along with theatrical promotions during the film Happy New Year have also been done. On the launch day, one will see full page newspaper ads in Gujarat Samachar, Sandesh and Divya Bhaskar, while radio activities on My FM and others will continue. Also, special promo has been created with eminent personalities such as Yusuf Pathan, Irrfan Pathan, Murari Bapu etc. from across industries to endorse the channel. On the digital advertising front, we will include Facebook-targeted spots and YouTube pre-rolls for all Gujarati content and this entire campaign will go on for three weeks post the channel launch”. An in-house team along with agency The CO, have devised the campaign, while the outdoor campaign have executed by Milestone Brandcom. The media planning for the revived channel has been executed by an in-house ad sales team and Vizeum. In consonance with the philosophy it has roped in prominent names like Ketki Dave, Vrajesh Hirjee, Krishna Gokani and Sanjay Goradia while welcoming fresh faces like Sohan Master and Sagar Panchal as part of its talent showcase. The innovative new line-up will evoke laughter through its depictions of love, togetherness, relationships, friendship and a zest for life. ‘ETV Gujarati’ has partnered with top production houses to offer the very best in Gujarati entertainment to its viewers. The channel’s production partners include Sango Telefilms, Interscope Communications, Click Digital Studios India Private Limited and Vrajesh Hirjee, Meenaa Gheewaala Telefilms, We Workshop Entertainment and Entity Productions for the new shows. The channel promo packaging has been done by Supra Films by Rajul Mishra. Pati thayo Pati Gayo: A hilarious take on a husband torn between two wives, this show depicts the tug of war that Kamlesh faces daily. Trapped in two marriages by circumstances that were unavoidable, he has one traditional wife while the second wife is chic and modern. What follows is his attempts to keep both wives happy. 1760 Sasumaa: 1760 Sasumaa is a supersonic comedy and an unconventional twist to the most interesting relationship between the mother-in-law & daughter-in-law. 1760 Sasumaa will see kitchen politics break into the police station in a hilarious power play between the mother-in-law & daughter-in-law as they see their roles reversed in the workplace. The show will see queen of comedy “Ketki Dave” essay the role of the maverick mother in law, Ganga while Krishna Gokani will play the daughter in law, Tilotama. Aa Family Comedy Che: A saga of two rival families, Shastris and Jobanputras, this rib tickling comedy depicts a clash of personalities and families. Charu from the Jobanputra family and Disha from the Shastri family are the female protagonists of the show, who together vie for the attention of Parth Jobanputra. This comedy of errors will witness the triad, bringing alive classic humor. Kanho Banyo Common Man: This is a parody on how Lord Krishna’s Earthly trials and tribulation. The show revolves around Gopal, a good hearted boy who is however, good for nothing. His sudden death brings him face to face with Kanho, but Gopal refuses to accept his death and challenges Kanho to live life on Earth as Gopal. Hirjini Marji: Featuring the comic veteran, Vrajesh Hirjee, this show is a spoof based stand-up comedy that doles out rib tickling humor. With Vrajesh Hiree donning the dual role of producer and anchor, this show will see also in Ojas Rawal, Manan Desai and Smith Pandya in pivotal characters. Daily Bonus: Anchored by the fresh face - Sohan Master, the show is based on the three core needs of human nature - Necessity, Comfort and Luxury. The show will see its crew travel to different localities and interact with families for some fun and games with rewards along the way. ETV Gujarati is currently available on all DTH and digital platforms like Tata Sky, Dish TV, Airtel, GTPL, Den, InCable, Dewshree, Videocon d2h, Reliance Digital, Sun Direct.